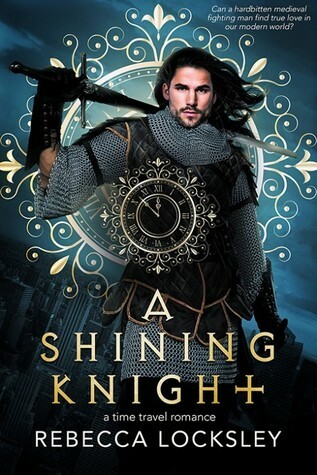 A Shining Knight Review ~ Does not disappoint … 9 out of 10! Cover Art: The background on the cover is a cityscape at dusk or a stormy day. In front of the city, a knight stands, sword across his shoulder, dark hair blowing in a breeze. A timepiece is in front and behind him, and he is wearing chainmail. The title and the author’s name appears in bold print that is easily read. The cover is attractive and states that it is a time travel romance. Time travel was always my thing as a young reader, so this really pulled me in. Synopsis: The synopsis is two short paragraphs and does the job, but it didn’t really hook me at all. The book is much more interesting than the blurb lets on. Perry immediately stands out as the narrator of the accidental travels through time. His emotions are written very well, and he really draws you into his story. Jordan’s struggle to acclimate and be relevant in this new world is very touching and really endeared me to him. Plot: Gabriel is tasked with watching over accidental time travelers Jordan and Perry. He is one of only a handful of people who can understand medieval French. Can he assist in acclimating the two strangers without losing his heart? Can he keep them safe from those who want to erase their existence? It’s a straightforward, interesting plot. Flow/Continuity: The story flowed well, and I found nothing that took me out of the book. Conflict and Climax: We’ve got a couple of time traveling medieval guys, a modern scholar, Chinese gangsters and some wacky housemates. It was a fascinating ride up to the climax, and the falling action was done quite well. Writing Style: This story is written in first person from Perry’s point of view, alternating with third person. I have never read a book in this style before, but amazingly enough, it worked for me. I loved seeing Perry’s observations of modern life, and his views of Jordan, Holly, and Gabriel. Editing: Editing was spot on, and I found no issues. Formatting: Formatting was done well, in a nice large font that is easy to read. Conclusion: Growing up, I cut my teeth on knights and time travel romances. To see it now in my favorite genre really tickled me. I was not disappointed! The book was really engaging and kept my interest throughout. All the main characters were really well written. The one thing I noticed was that there was no denying the existence of time travel from Gabriel or our other modern characters. I was SO thankful for that. It gets so old, the main character denying the possibility of time travel that goes on forever. That can be so incredibly annoying, and it was refreshing to see Gabriel just shrug and move on. I will definitely be following this author to see what other goodies she has in store! Previous Lodging the Alpha’s Omega ~ Worth reading … 8 out of 10! Next The Captain’s Baby Review ~ An exciting read … 8 out of 10!